Here is an interesting decal release from Modeller, F-86F Sabres of the Imperial Iranian Air Force. 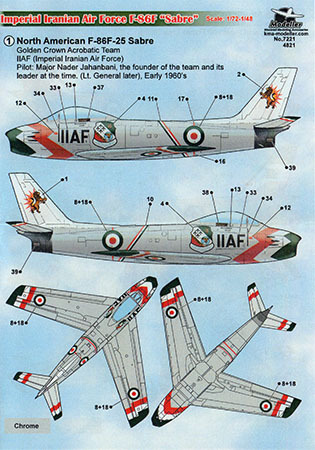 This set provides an interesting cross-section line and demonstration aircraft including a combat veteran deployed with the UN to Congo. You can see in the decal image that some of the roundels have separately printed red dots for the center. These decals are printed by Begemot Decals, and I'm impressed that the clear carrier film is no larger than the printed areas, very precise printing indeed. 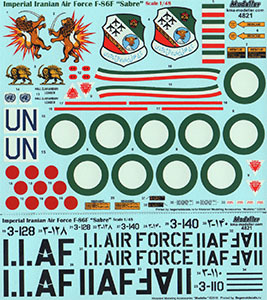 While the decal sheet provides a website address (www.kma-modeller.com), the website isn't available at the times we tried, so if you're interested in acquiring a set of these decals, you'll have to email or message the folks at Modeller for pricing, availability, etc. For more information about this set and the other releases from Modeller, you can reach them at khosravi440@gmail.com or contact them through their Facebook page. My sincere thanks to Modeller for this review sample!